MUSKEGON, MI — It is hard to imagine the era on Lake Michigan when Great Lakes sturgeon were abundant, a period when these great, large and unusual fish swam freely in our waters, ran up our rivers to spawn and fed with little consequence. During those unencumbered years so long ago, their numbers were high; the males often lived to be 50 or more years old, and females lived more than 100 years. Scientists say they know of 95 historic sites in the Great Lakes basin where lake sturgeon once spawned. That’s not so any more. Forty-three of those are gone, the result of dam construction and habitat loss. Sturgeon numbers also were reduced by the effects of pollution, historic over-harvest by anglers and slaughter for no other reason than having become a nuisance to commercial anglers with nets. Old monochrome photos of them stacked up like cordwood are unflinching. 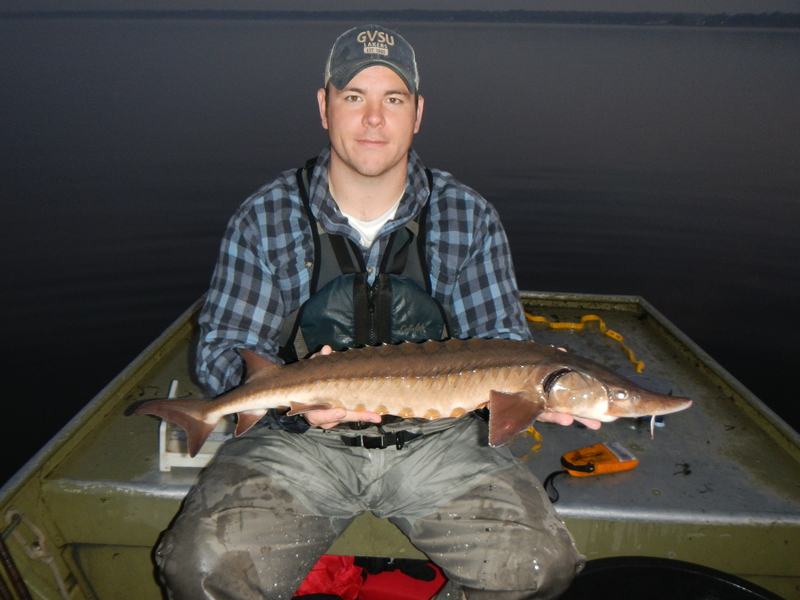 Fortunately state, federal and tribal scientists today, with the help of grass-roots support, are working to restore the native lake sturgeon population. 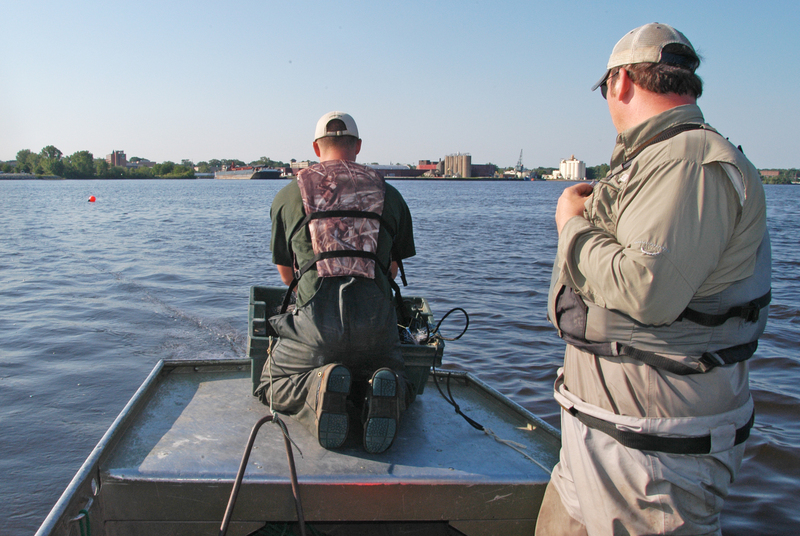 On Lake Michigan, the most recent project takes place on the Muskegon River where a streamside rearing station will be built and come online in 2014. Like others in use on the Kalamazoo and Manistee rivers, the portable facility will be a small incubator designed to give the sturgeon a helping hand. Remnant sturgeon populations now spawn on only 12 Lake Michigan tributaries, according to scientists. That compares with 30 in the past. The young sturgeons likely will be six to eight inches long: big enough run the downstream gauntlet, past predators and the B.C. Cobb power plant’s cold-water intake, where 150 a year historically were sucked into turbines before Consumers Power erected a blocking net. They will swim into Muskegon Lake, which acts as a nursery. They are long-lived and slow to spawn. A male sturgeon spawns when it is 8 to 12 years old, then every other year. Females take 14 to 30 years, then spawn every four to six years. The new rearing facility is expected to increase the odds of reaching the target 30 percent survival rate needed to develop a thriving adult population. 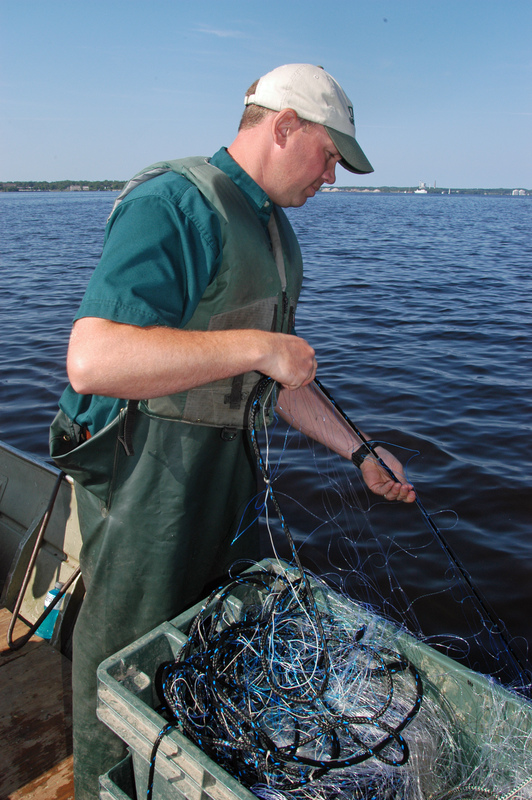 Smith and his research team have been netting and marking sturgeon on Muskegon Lake for the past three weeks. Their daily net checks yielded an average of six to 10 sturgeons each week. Many of those, he said, were unmarked fish. The Muskegon River system is home to approximately 160 adult sturgeons, according to the state’s sturgeon recovery plan. To build the population to 300 could take 25 years. The Muskegon rearing station will be funded by DNR grants and an existing settlement agreement with Consumers Energy that sets money aside each year to help improve fisheries on rivers where the company operates dams. That funding is expected for five years, after which, other funding will be needed. Sturgeon recovery on the Muskegon River will require water-quality monitoring, according to O’Neal, along with efforts to gain improvements in water temperature and dissolved oxygen levels, which drop dreadfully low in the heat of the summer. Outreach, fundraising, school tours and public relations work will be handled by the Muskegon River Watershed Assembly, a nonprofit organization that works with a variety of Muskegon River issues. “The lake is an important nursery,” O’Neal said. “We know that most of the juvenile fish stay in the lake for five years,” he said. The Muskegon River sturgeon station will be one of several located around Lake Michigan. Portable stations already operate on the Kalamazoo and Manistee rivers, the Cedar and Whitefish rivers in the Upper Peninsula and at Milwaukee and Manitowoc in Wisconsin. Those combined efforts are showing some benefit, according to Smith. More and more juvenile sturgeons are showing up in the annual surveys that are conducted on Lake Michigan. Twenty-five years is a long time to wait to see these magnificent fish return to abundance on Lake Michigan. But working to improve their survival eventually will take them off the state’s threatened species list. I might never get a chance to see the abundant river runs Native Americans once spoke of on tributaries such as the Grand River, but seeing them return is something worth looking forward to. As of now, one can only imagine the possibilities. This entry was posted in Uncategorized and tagged Conservation, Consumers Energy, DNR, Environment, Fish, Great Lakes, Lake sturgeon, Michigan Department of Natural Resources, Muskegon River, Sturgeon. Bookmark the permalink.